Decision Making comes in all sizes and degrees of difficulties. Some decisions are small and insignificant. Others are large and life altering. Many are in between. Your decisions are affected by money, stress, time, facts, data and resources. These factors need to be individually and collectively considered when making your decisions. Money — It governs what you can and can’t afford. For example, if you want a $50,000 car, but can only afford a $20,000 car then you will only look for cars in that price range. Or, you must be willing to readjust (or violate) your budget. Stress — Internal or external pressures can affect your decisions. Although some stress is always present when making any decision, it can be managed. If you are under a lot of pressure and time is available, hold off your decision until later. If time is short, then acknowledge that you are under stress and strive to minimize its effects on your decision. Time — Sometimes there will be adequate time available to make a good decision. At other times it will be limited. You may not be able to investigate as many aspects of your decision making as you might like. In these cases you must depend on your current knowledge, experience, schooling, reasoning, intuition, common sense and confidence. 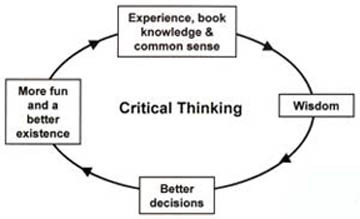 In other words; your critical thinking skills. Facts, data and resources — There are vast information resources available today. The primary ones include: the web, bookstores and libraries, experts, colleagues and friends, classes and software. People who grow as critical thinkers and become good at making decisions make it a point to learn from every decision (right or wrong). They are willing to experience new things and learn ideas and concepts with an open mind. Experience and book knowledge coupled with common sense leads to wisdom. Wisdom leads to better and more confident decisions. Better and more confident decisions lead to a better existence in general. Click here to learn the 7 Decision Making Steps.